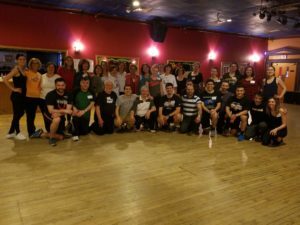 Forty Greek dance enthusiasts gathered in Cambridge on April 28th to participate in Vimata: A Greek Dance Workshop. Stefanos Sakkas and Katerina Stefanou, who traveled from Ioannina, Greece, to teach mainland and island dances from across Greece, provided dynamic and masterful instruction. Yet despite the fast pace and advanced level of the workshop, Sakkas emphasized that the most important elements of learning traditional Greek dance are joy, patience and dancing with a smi le. After the workshop, participants and members of the community enjoyed revisiting the dances learned that day with live music by Vasilis Kostas, Panos Aivazides, Beth Bahia Cohen, Andrea Charls, and George Lernis, at a glendi presented in collaboration with the Greek-American Political Club. The days’ events were part of the ArtWeek festival, in its first manifestation as a state-wide event. Visit our Facebook page to view photos from the day’s events.